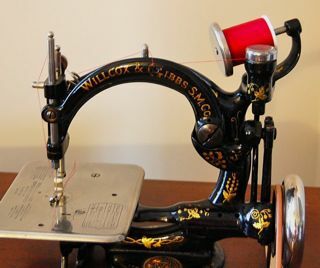 I get quite a few emails of how to sew a consistently sized buttonhole on the newer sewing machines. 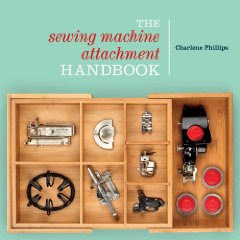 Most of the newer machines have a buttonhole stitch built in, and once learned, will be very quick indeed. 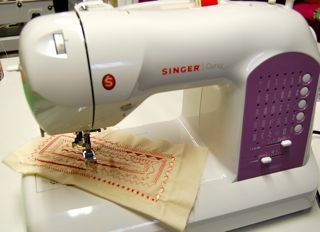 The Singer Curvy 8763 allows two choices for buttonhole widths. I choose the smaller width for my jacket. I also used an interfacing underneath the buttonhole for stability. Put your buttonhole foot on, noticing the red line on the side. Your machine will also have a bar that comes down in place. Mine fits between the two bars on the buttonhole foot. Place your button in the back of the buttonhole, sliding to fit. My button is one inch. After determining where the center of my button will be (that is now 1/2 inch), I draw a vertical line with a fabric marking pencil. At the bottom of my buttonhole, I mark a horizontal line. Place the fabric under the foot. The buttonhole foot is "spring-like". Don't try to force it back or forward. 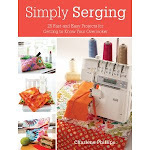 Give it a gentle push to allow it to "fall" exactly where it should be to begin sewing. 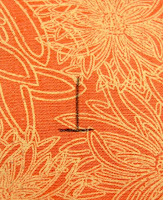 Line your horizontal line with the red mark - the bottom of your buttonhole. Line your needle with the horizontal mark. 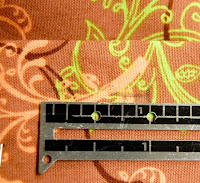 Lower the presser foot and begin sewing. I like to cut my top thread as soon as possible. One a few stitches have been made, clip it. Continue sewing. 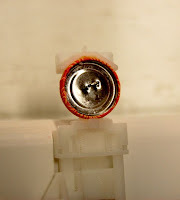 This prevents the top thread from entangling and adding imperfection to your finished buttonhole. Clip your buttonhole using a buttonhole opener or seam ripper (yes, I still use my sharp shears...). 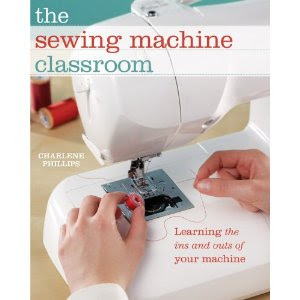 If you have a sewing machine with the buttonhole stitch, take time to pull out some scrap material, a few buttons, and just practice. 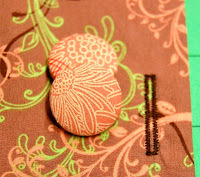 You will soon learn exactly how to mark and place your fabric for the most consistent buttonhole. 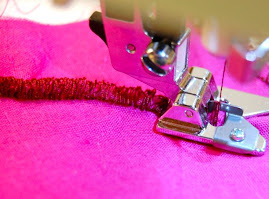 Want to make a corded buttonhole? 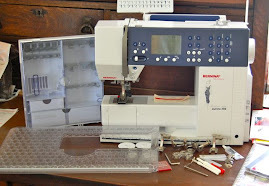 Coming up next time.....heading back to the sewing room to begin. Great tips! 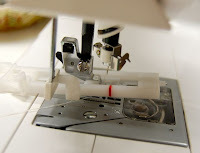 Lucky for me I have a machine with automatic buttonhole repeat - once I sew the first buttonhole to the size I want, all the rest automatically sew the same size. Gotta love technology! Amazing what the machines do anymore! So much easier to use.